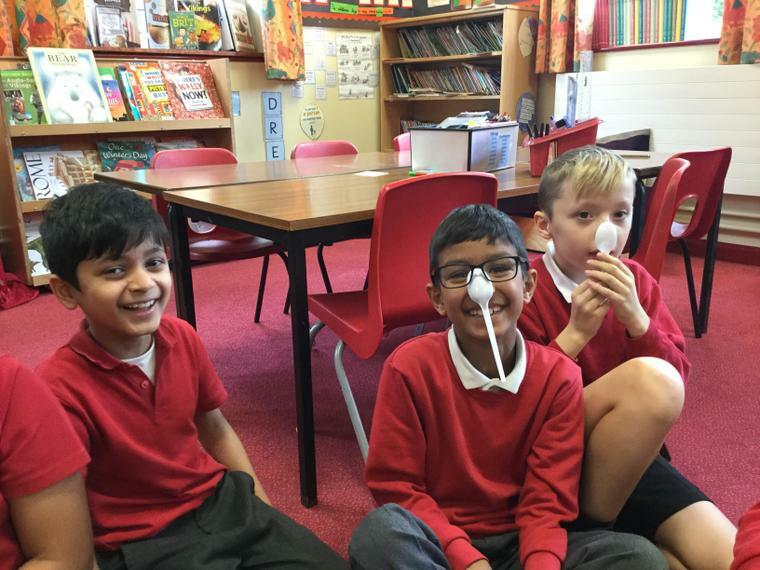 Welcome to Year 4's Class Page. 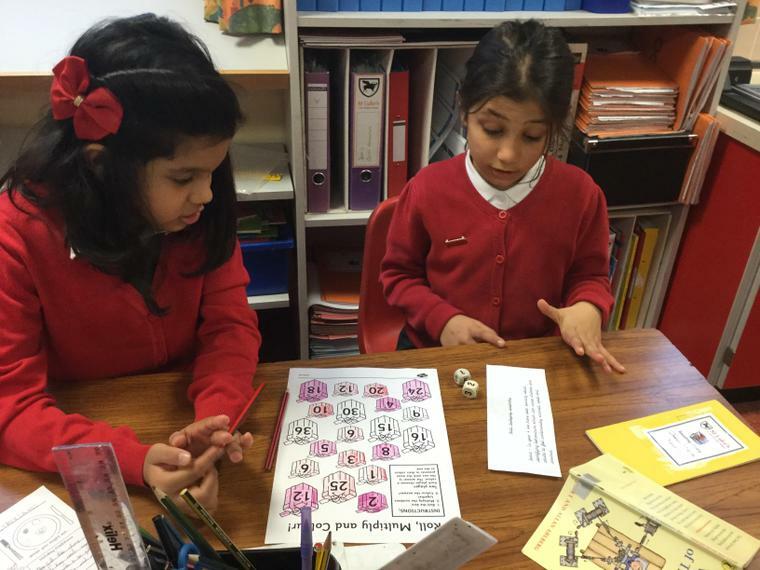 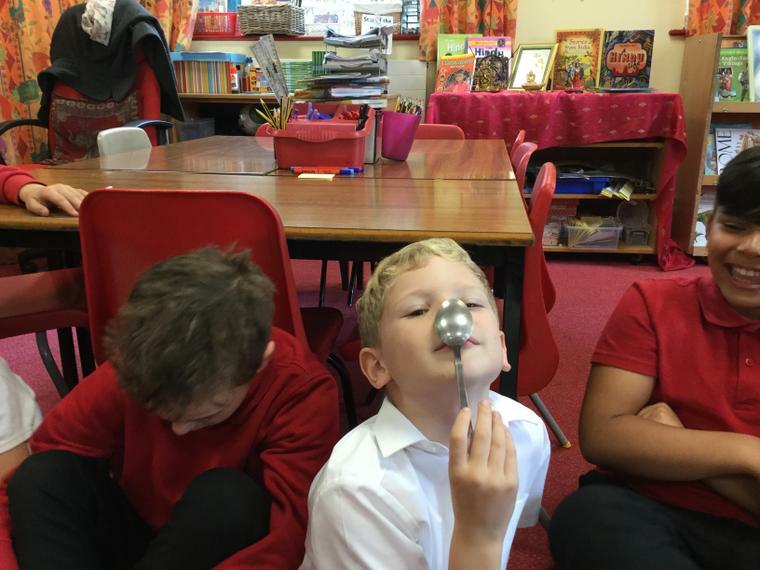 We hope you will enjoy finding out about our learning and all the exciting things Year 4 gets up to! 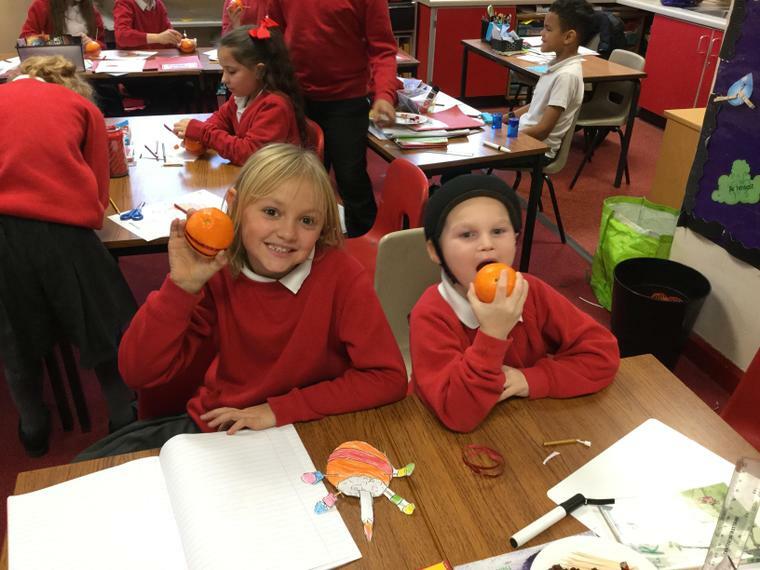 We will put our most recent posts first, so please make sure that you scroll down in order not to miss anything. 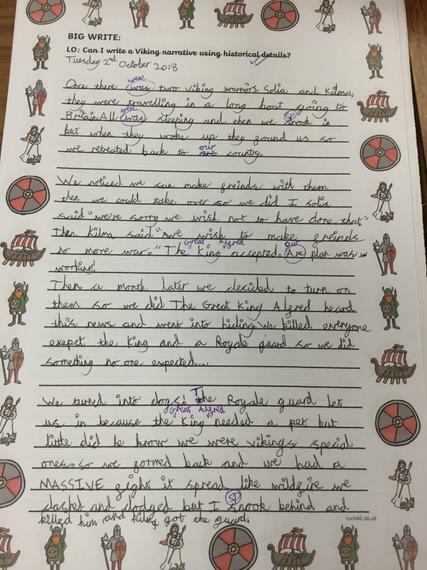 Homework – will be given out on a Wednesday and expected to be returned by the following Wednesday. 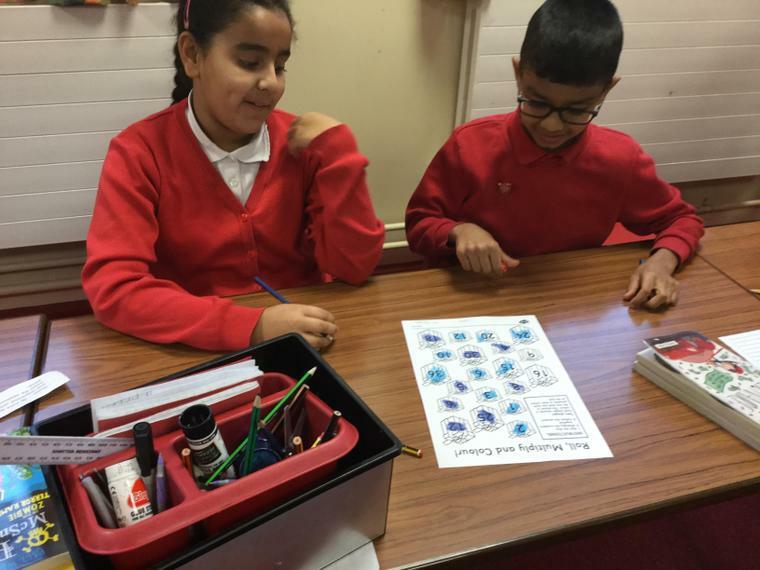 Spellings – every Monday. 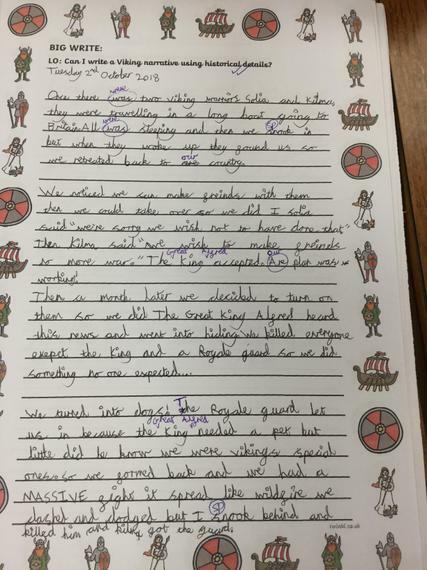 Please make sure your child has their spelling book available. 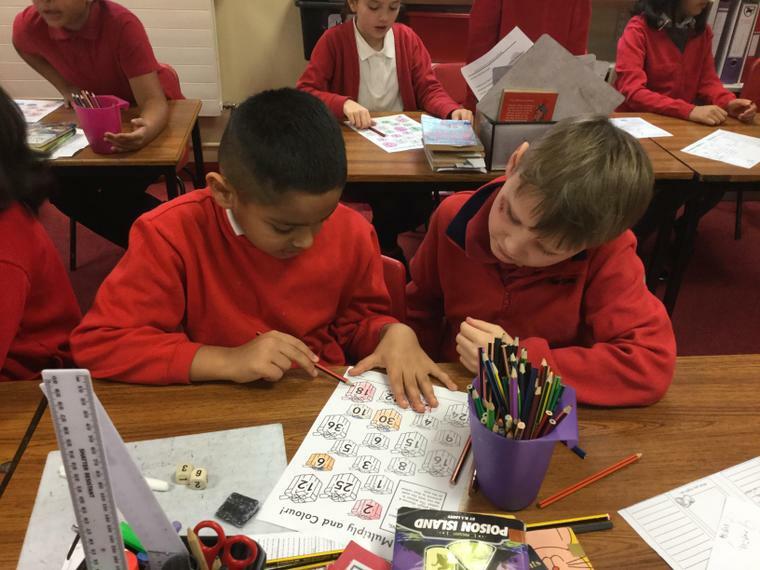 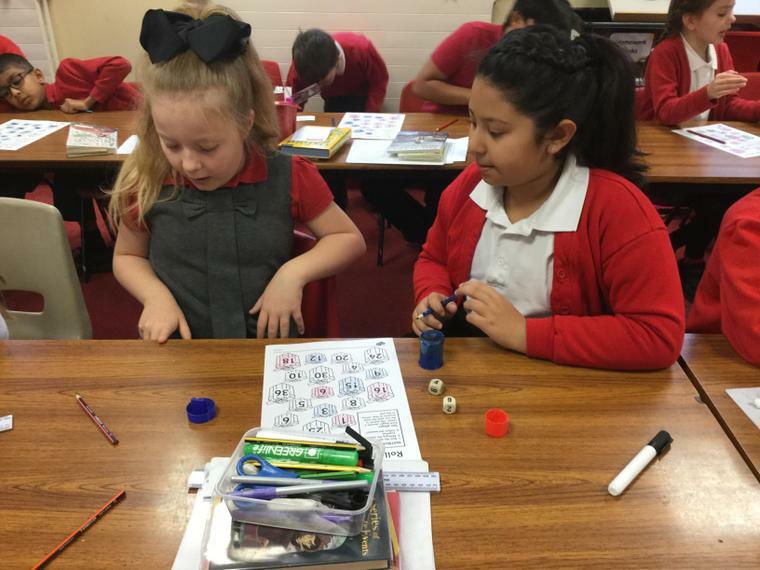 Mental Maths/Times Tables Tests – every other Thursday. 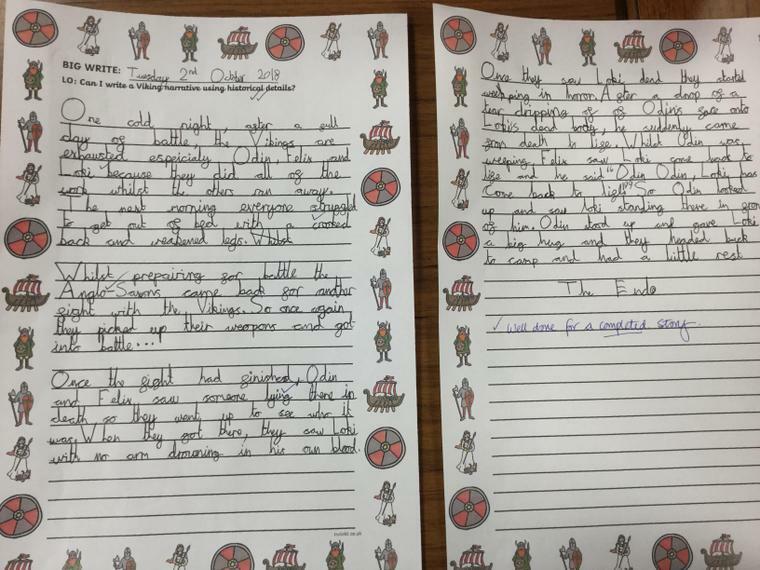 Reading Diaries – Please make sure you sign your child’s reading diary in order for them to change their reading book. 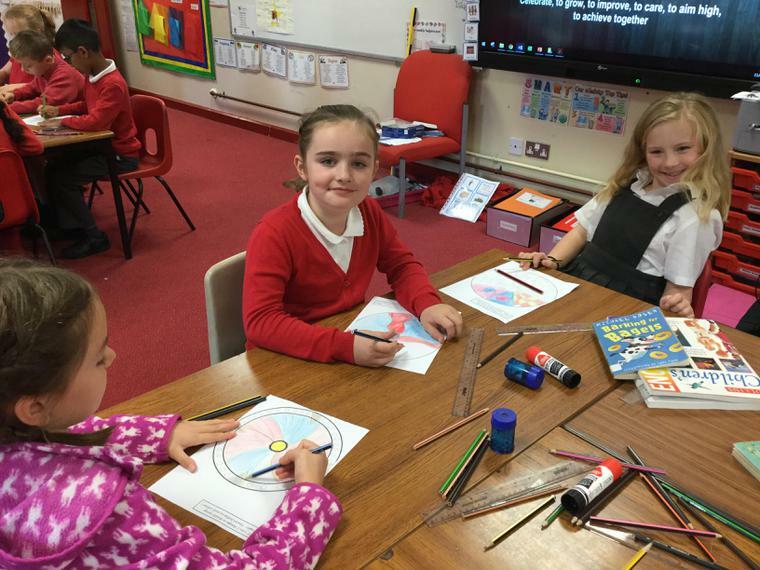 Library Books - will be changed every Monday afternoon. 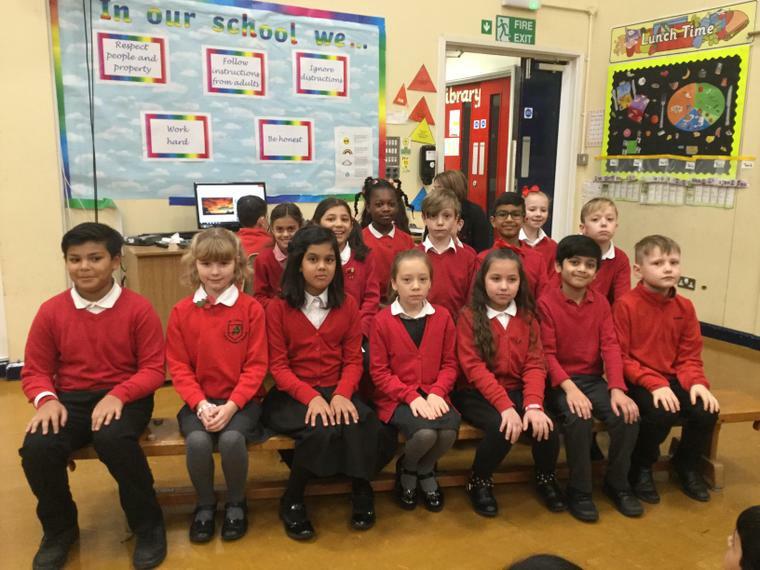 We are a friendly bunch - so if you have any concerns about your child, please do not hesitate to contact us. 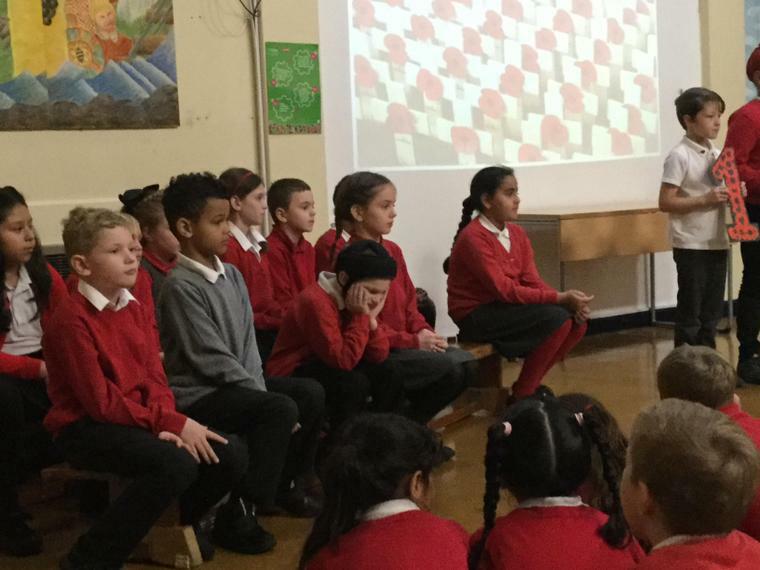 On Tuesday 22nd January the whole school had a visit from Alex McGowan who works for Leicestershire Library Services. 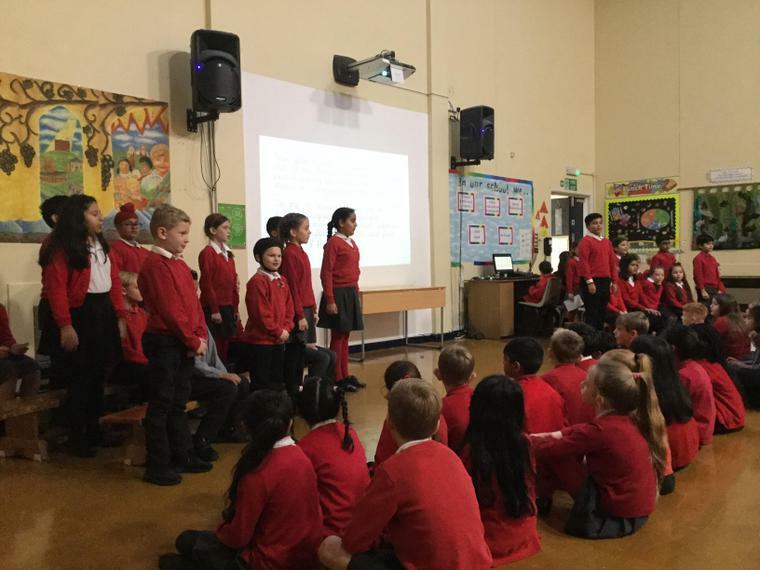 He came to inspire us all about poetry and to teach us some valuable tips about performing poetry to an audience. 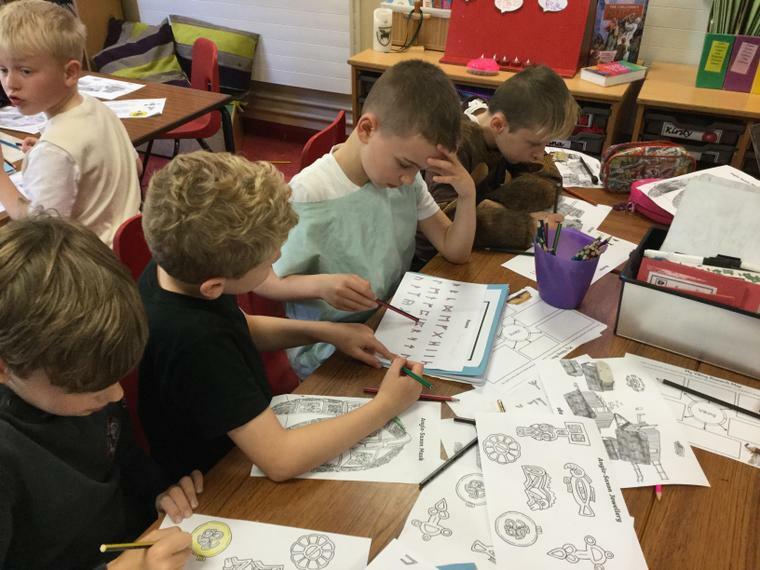 It was really fun, especially doing the poetry train! 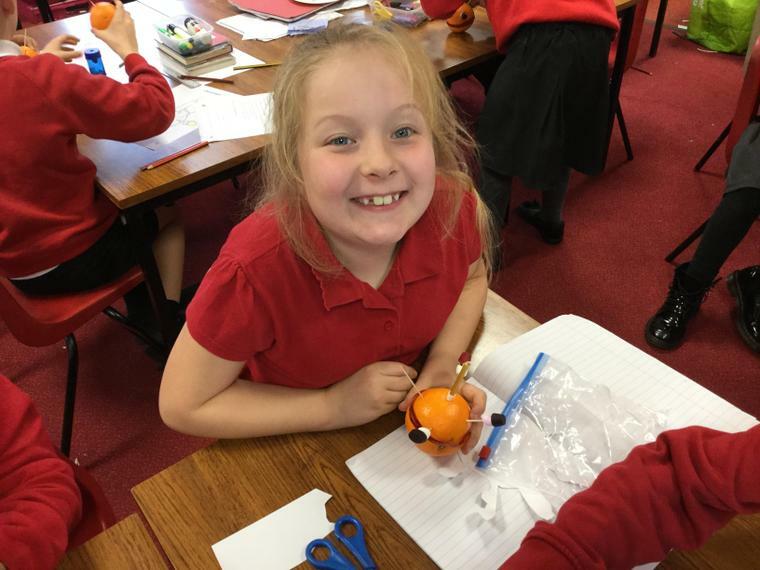 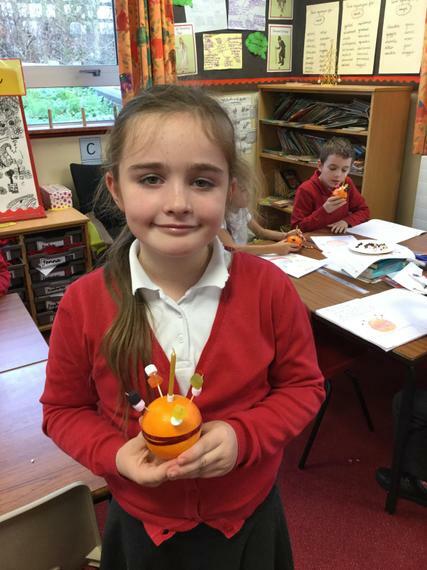 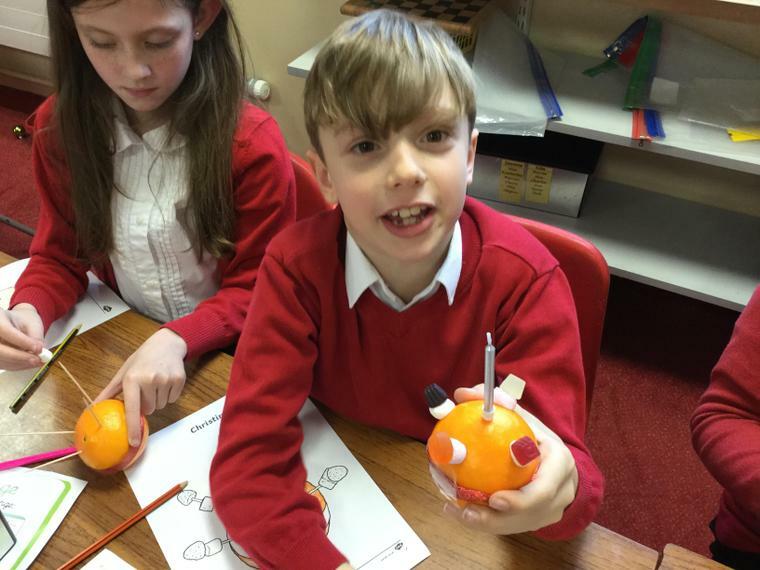 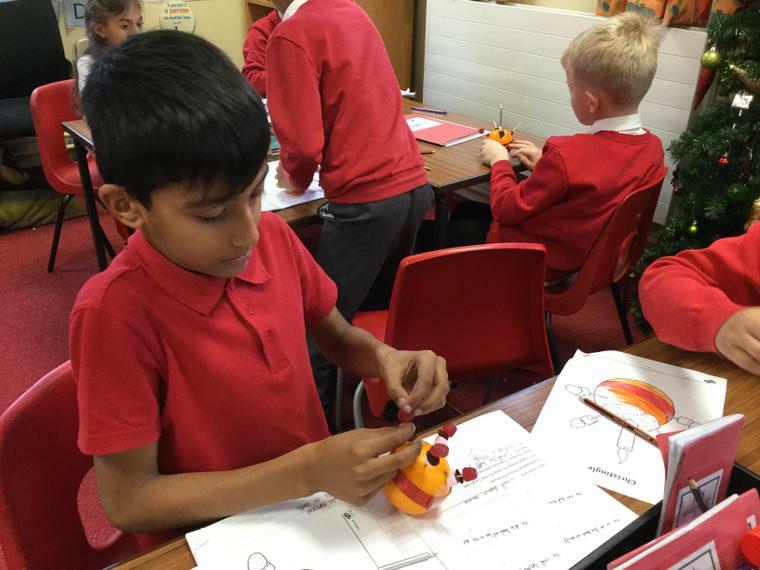 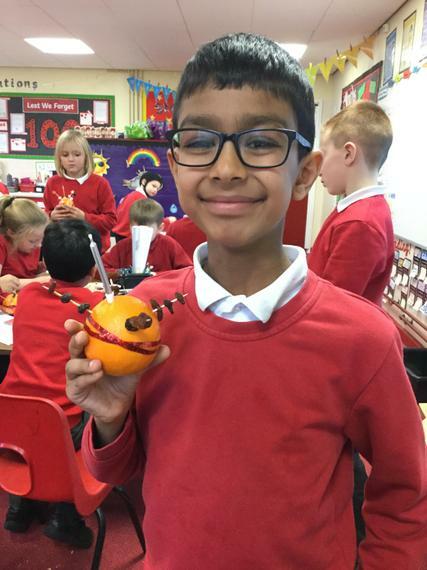 This week, as part of Advent and leading up to Christmas, Year 4 have been learning all about the Christian tradition called Christingle. 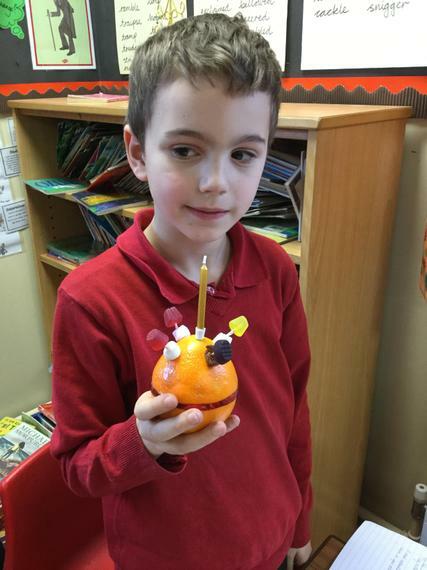 Each part of the fruit and decorations have a significant symbol in Christianity; the orange represents the world; the four sticks represent the four compass points and the seasons; the sweets and raisins represents the harvest God has given us; the candle represents Jesus as light of the world and finally the red ribbon represents the blood of Jesus. 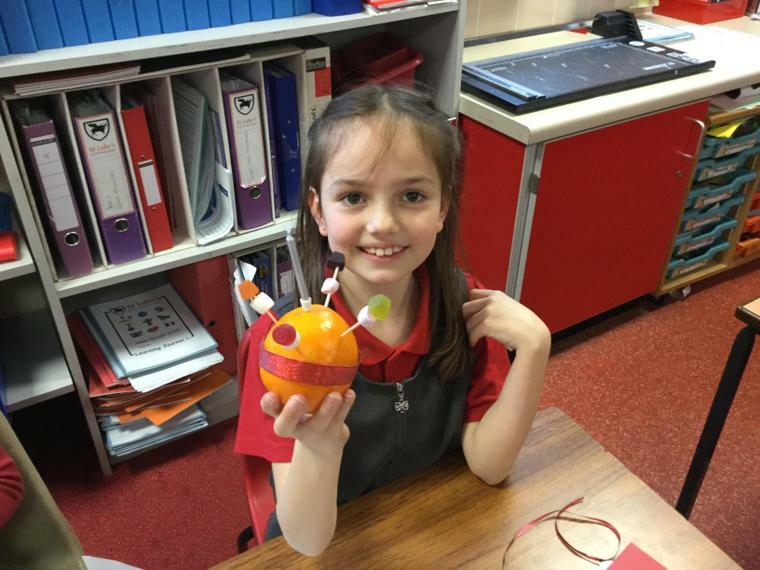 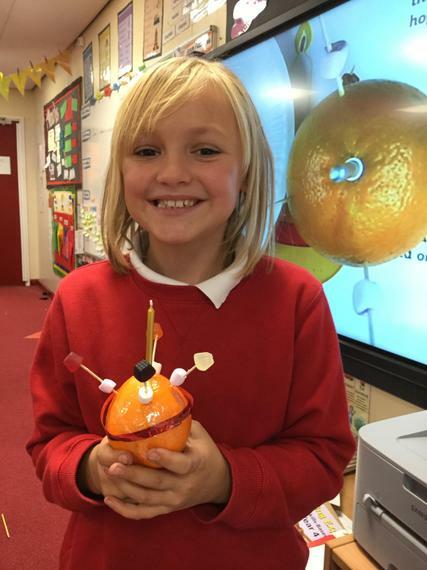 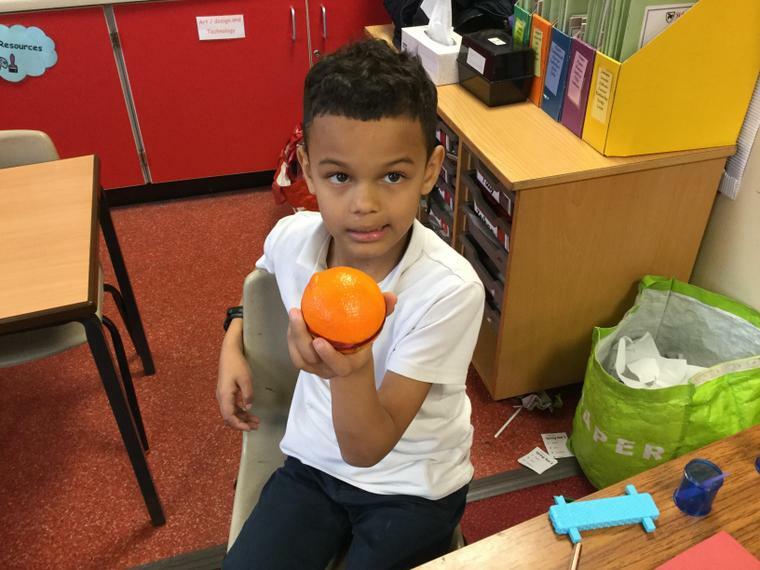 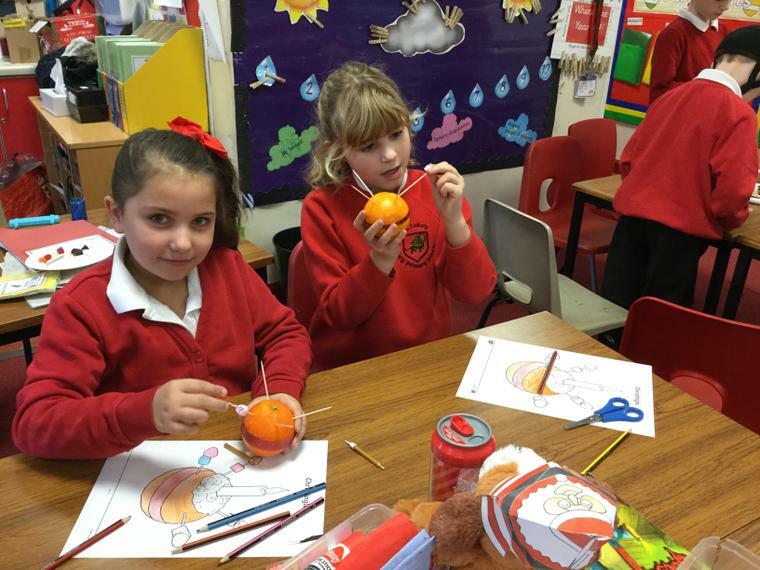 As you can see, the children really enjoyed making their own Christingles! 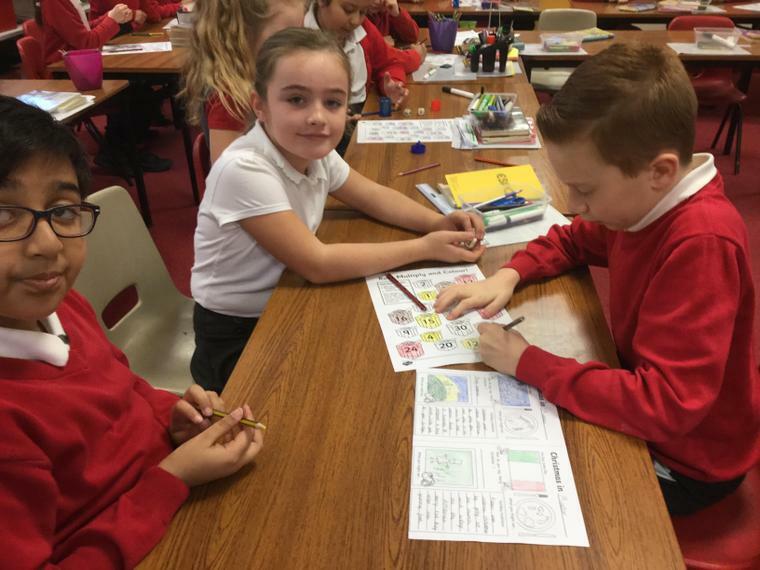 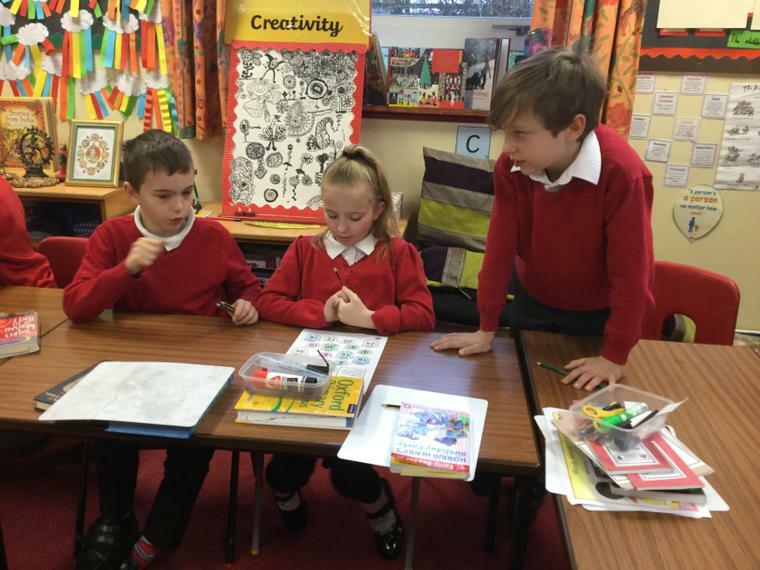 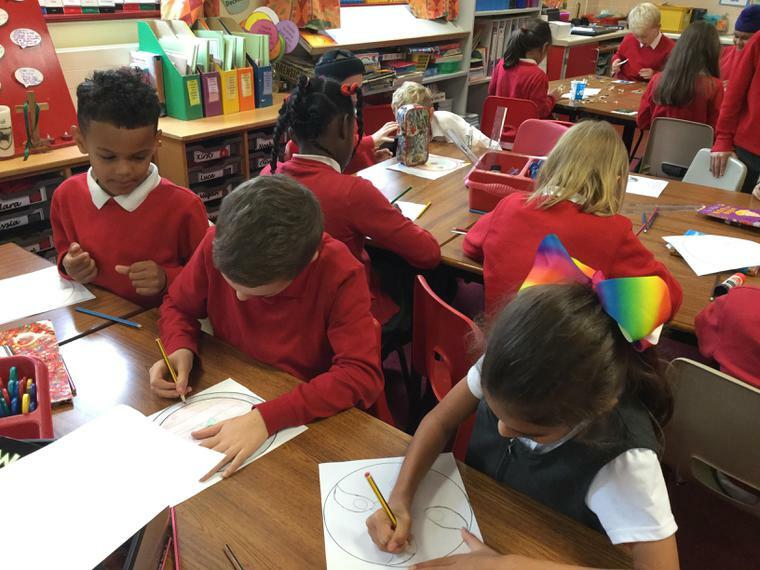 As part of a national initiative, year 4 have been doing some wonderful work on Anti-Bullying. 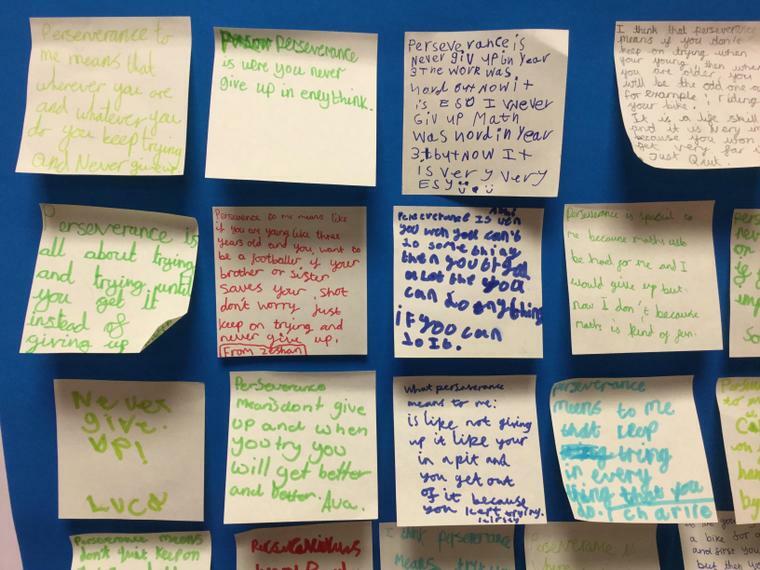 They've thought about different scenarios and when someone might be bullied. 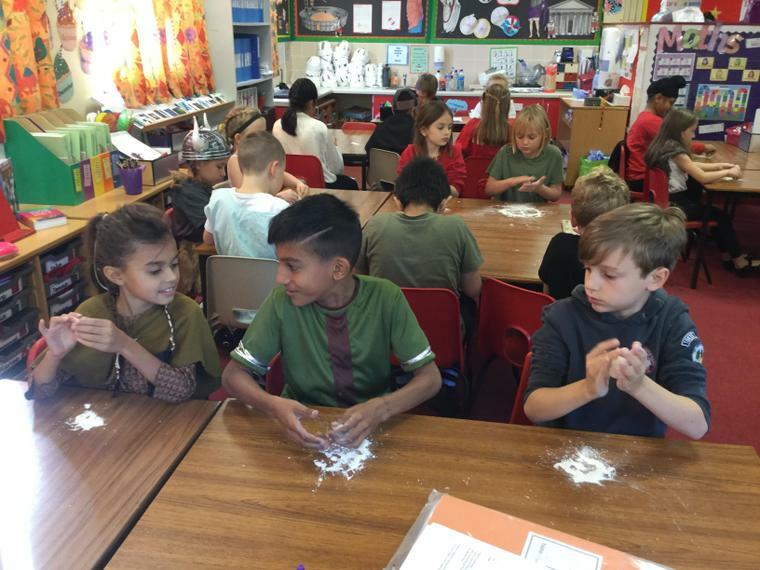 They have made friendship clouds for each other as part of showing empathy. 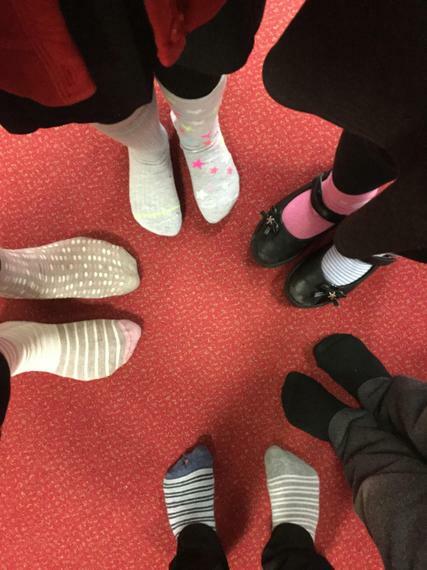 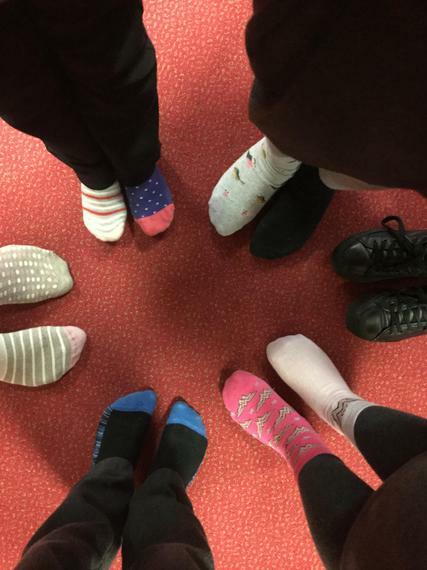 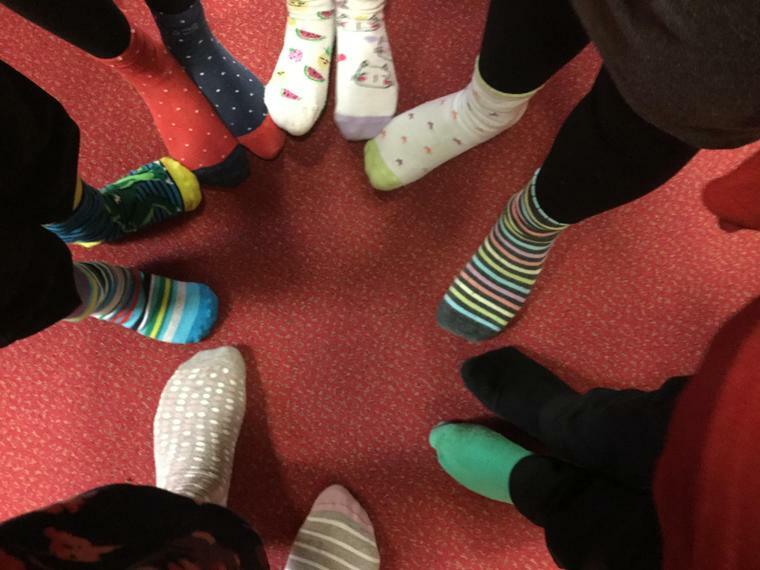 Finally, they came to school with different coloured socks to demonstrate our uniqueness. 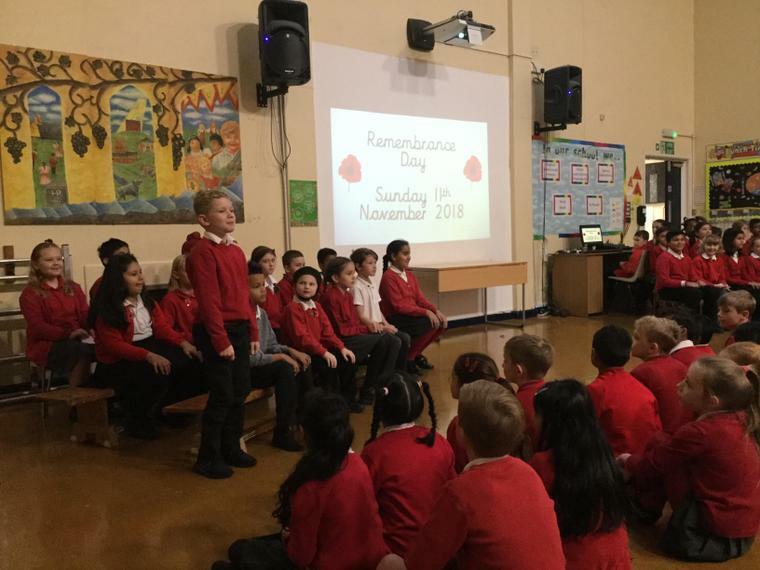 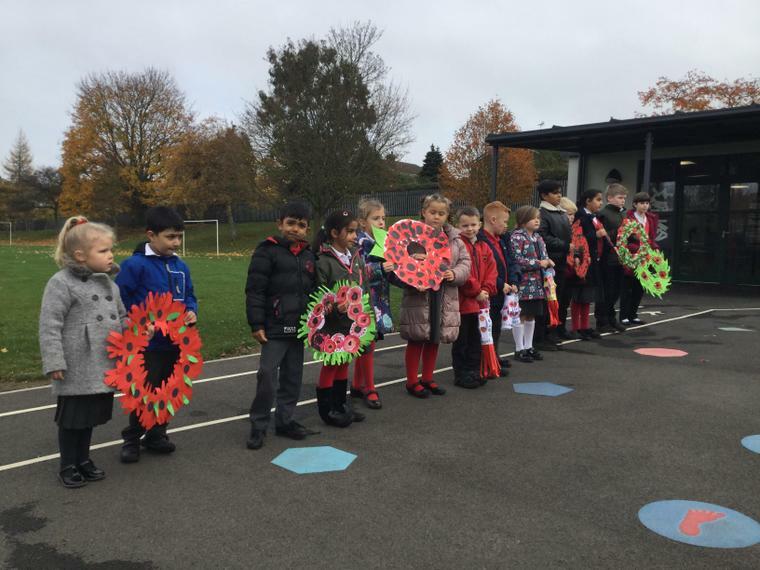 Friday 9th November, year 4 delivered a thoughtful and reflective assembly for Remembrance Day; they sang, recited poetry and explained the significance of the centenary. 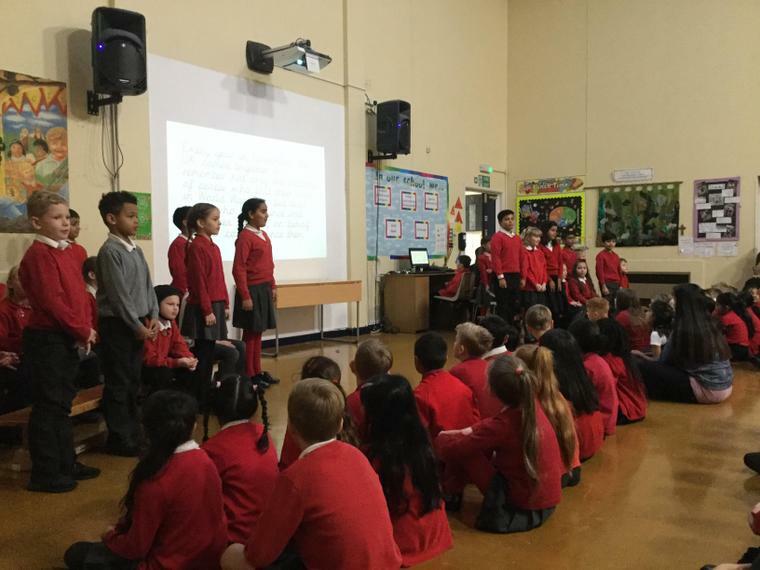 We were delighted with their performance and parents who watched conveyed the same message. 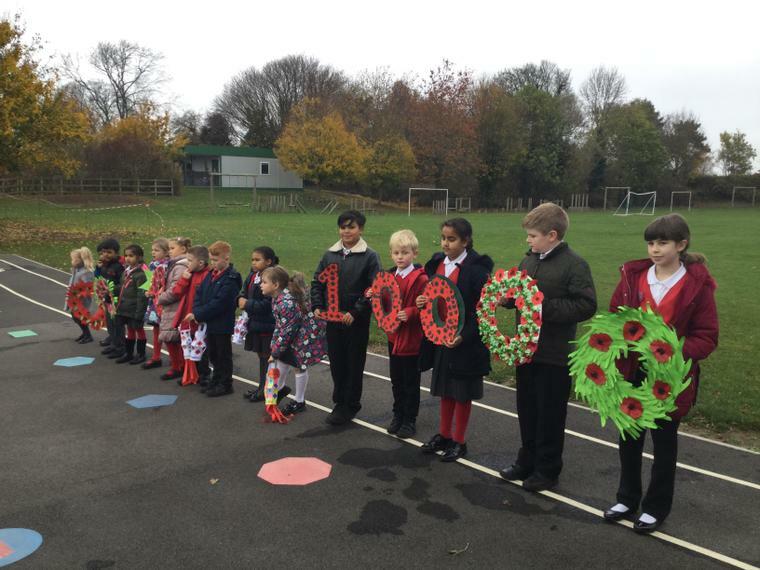 At 11 o' clock, year 4 joined the rest of the school outside, in two minutes silence in remembering those who laid down their lives for us. 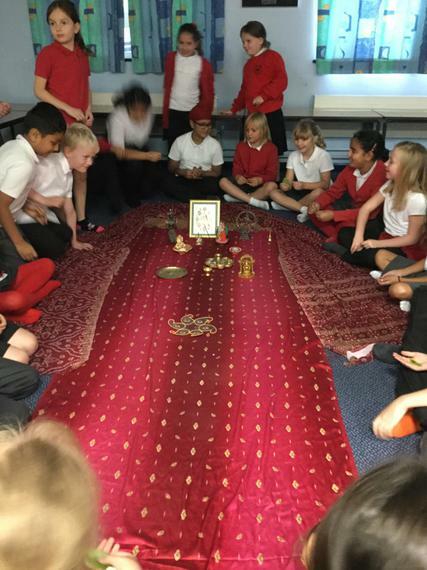 The year 4's read some of their poems and prayers were said. 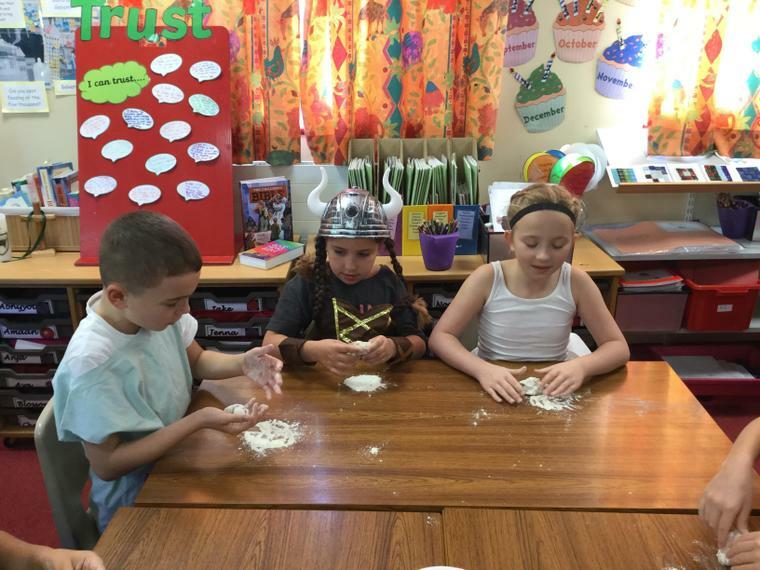 History came to life with Viking Day! 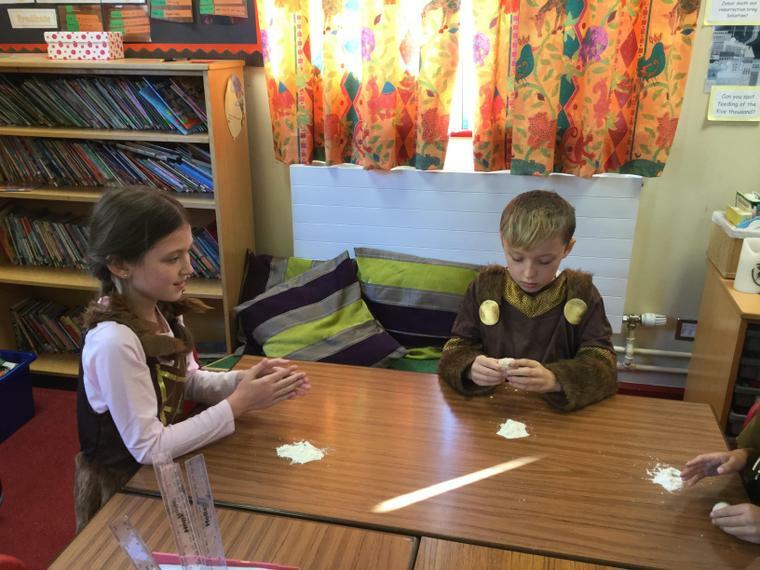 Year 4 had an amazing day of delving into history by dressing up as Vikings and Anglo-Saxons and learning all about key aspects from this era. 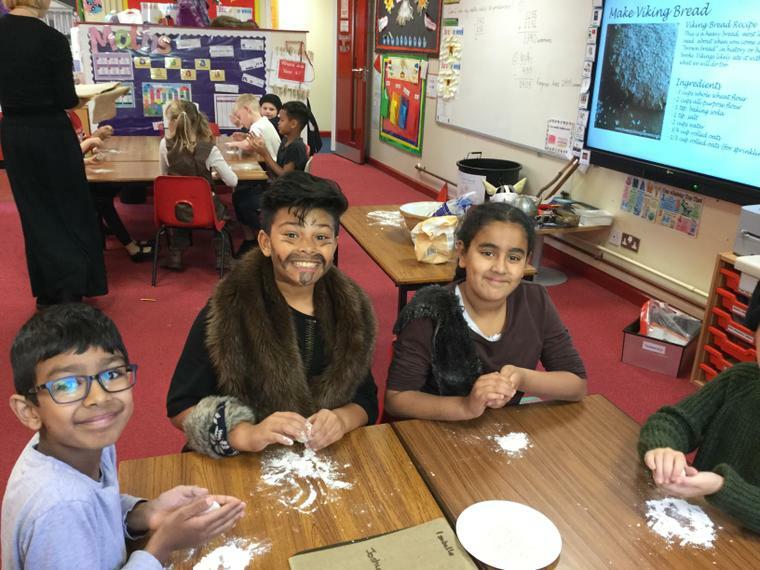 Firstly they had a debate at a ‘Thing’ which was an early form of parliament. 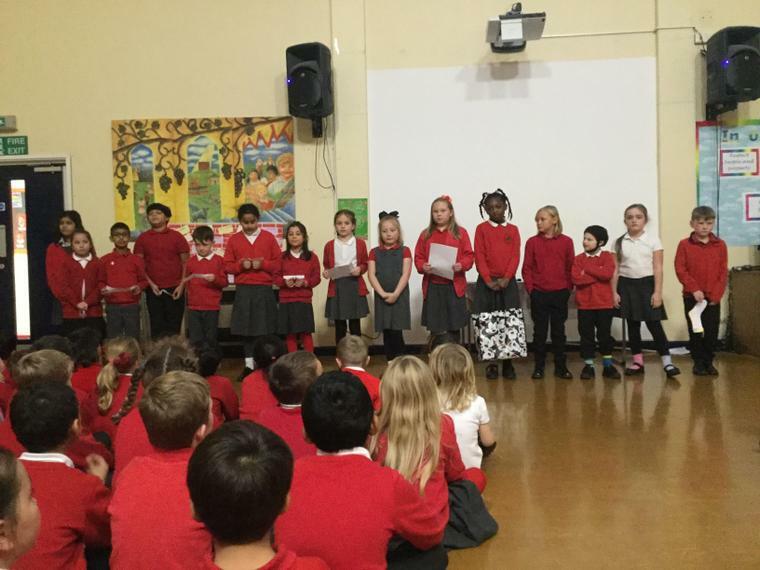 They wrote some excellent speeches and later performed them in front of the class. 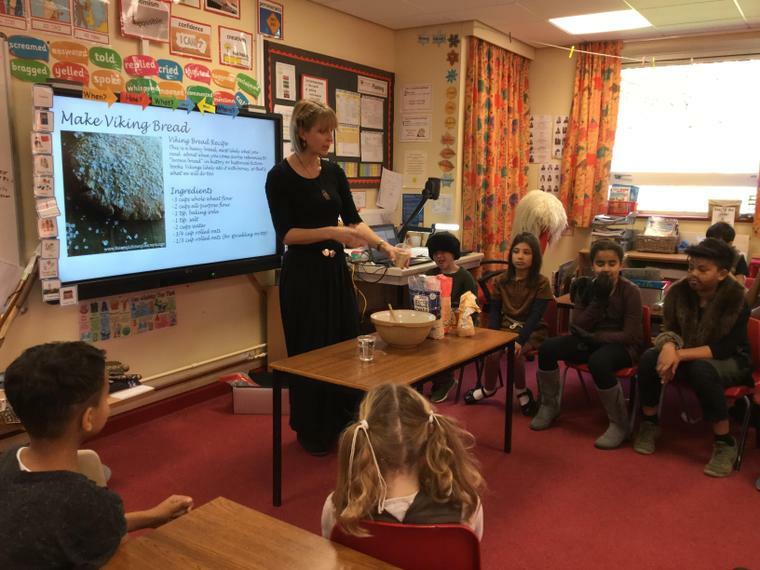 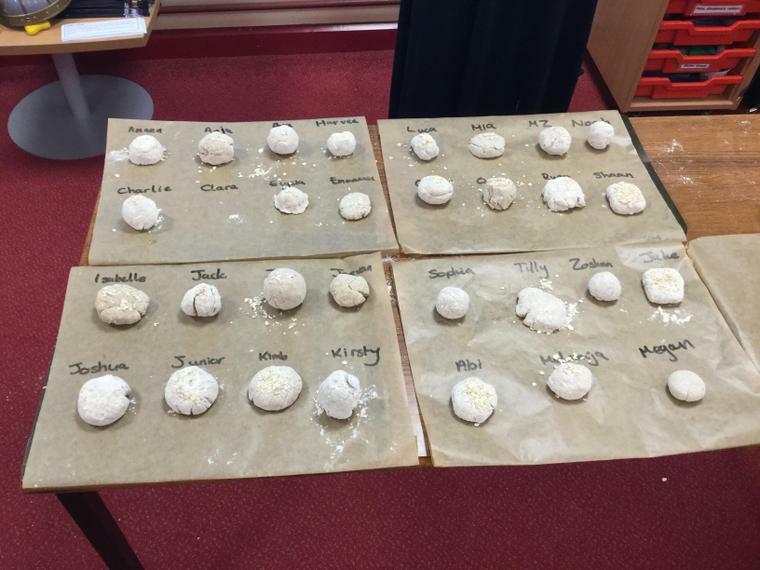 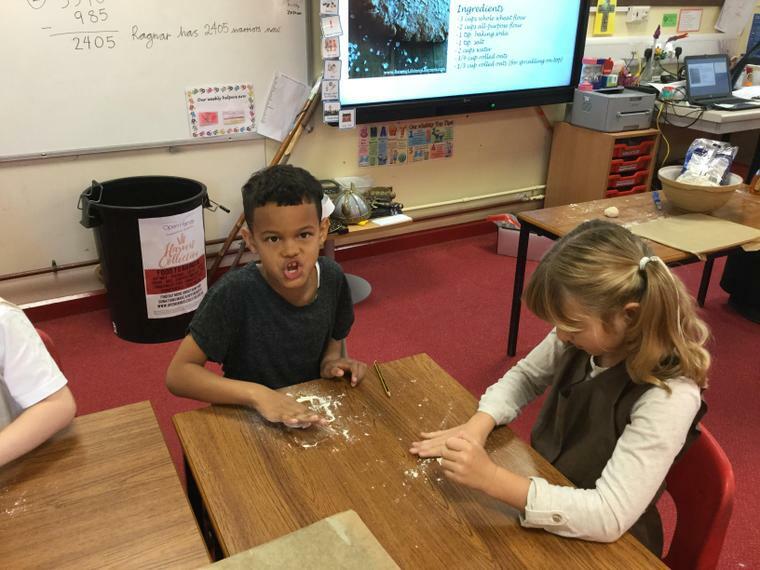 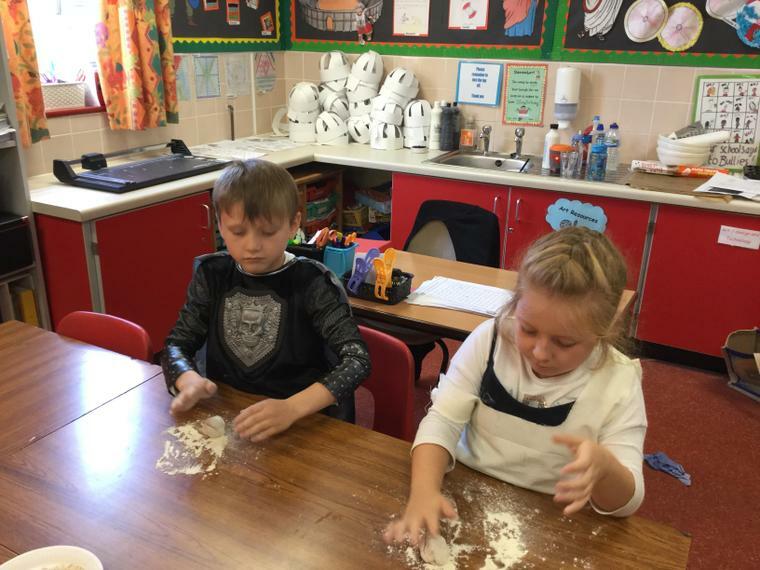 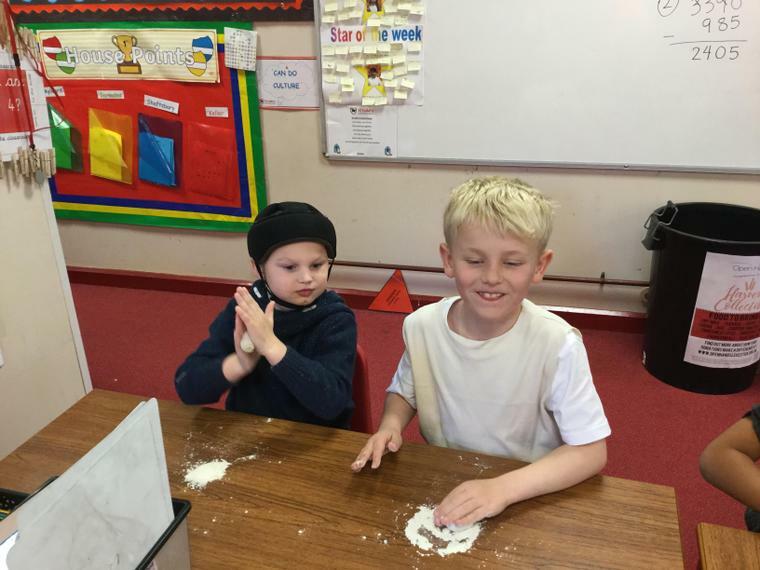 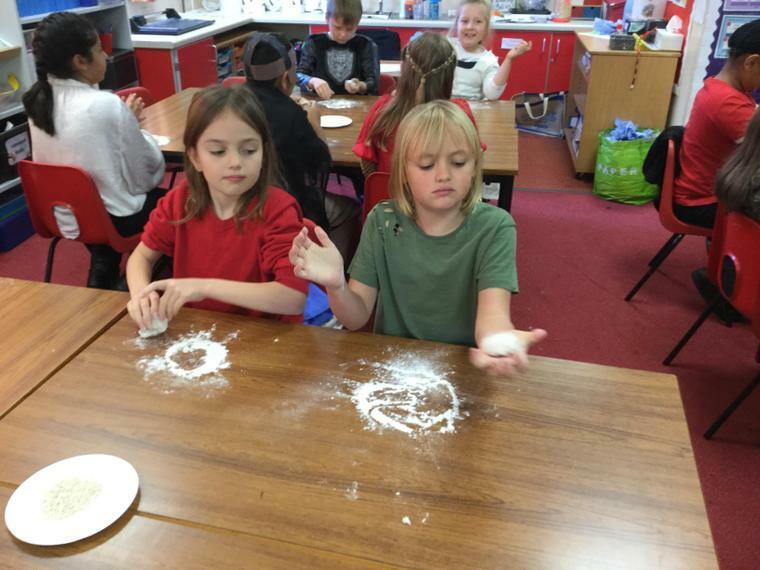 Children made Anglo-Saxon jewellery and even baked some very heavy Viking bread! 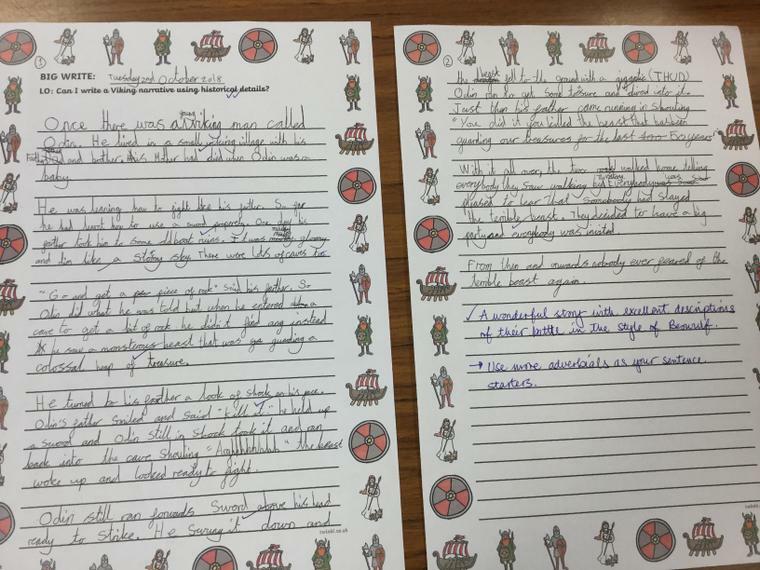 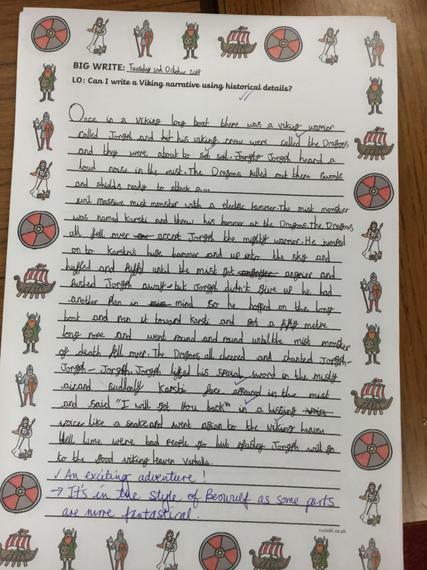 Throughout the day children did a range of Viking related activities that enhanced their learning experiences. 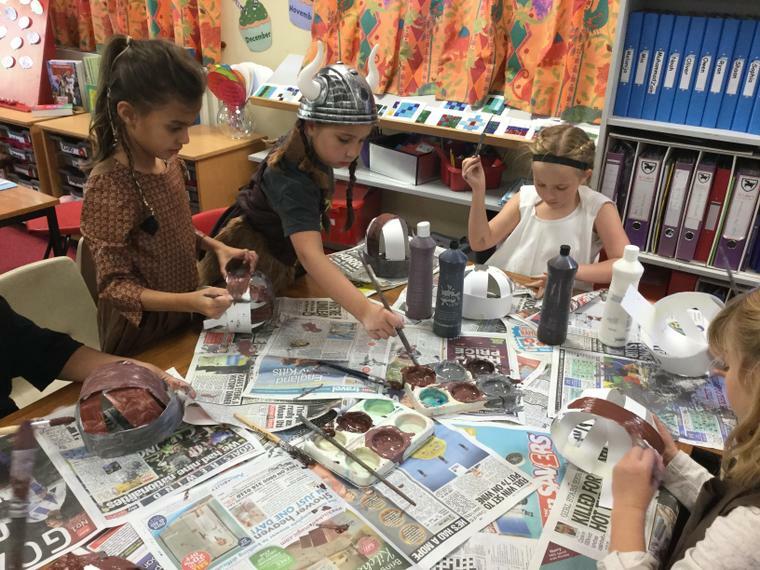 Thank you to all Year 4 parents for supporting our day by providing such brilliant costumes. 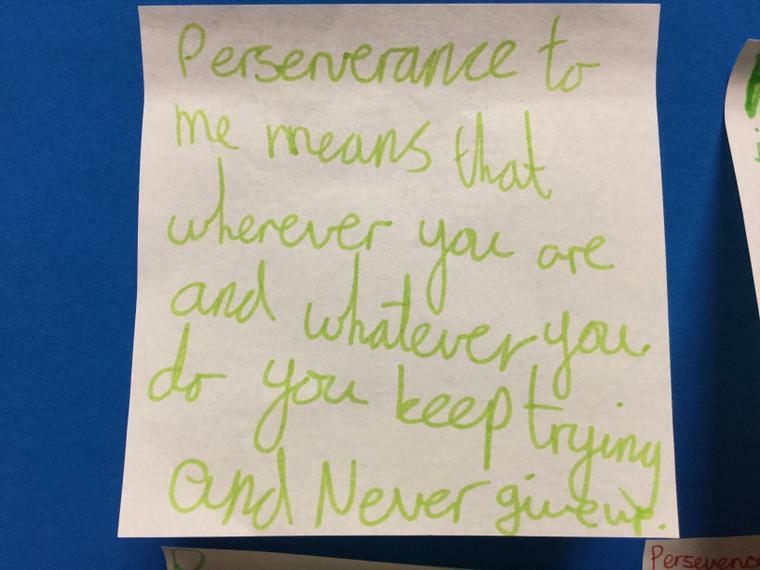 Year 4 have been thinking about one of our key characteristics in the 'Route to Resilience' scheme which is 'Perseverance' and reflecting on what it means. 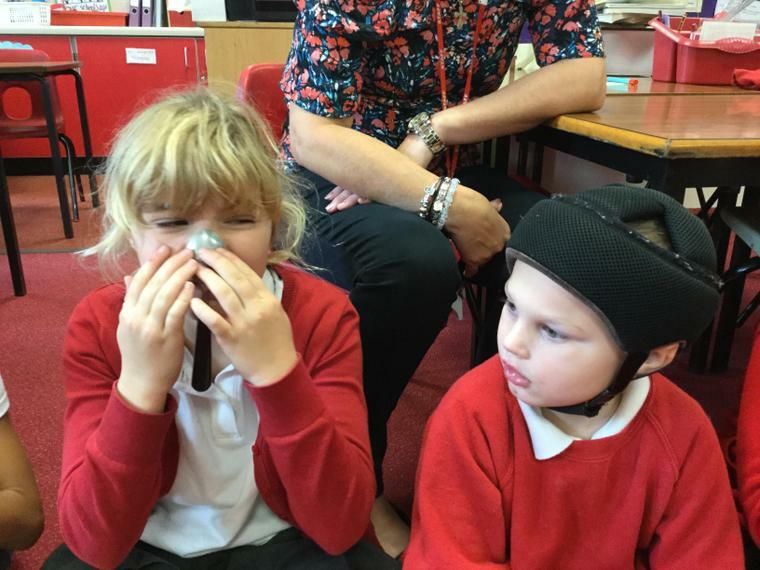 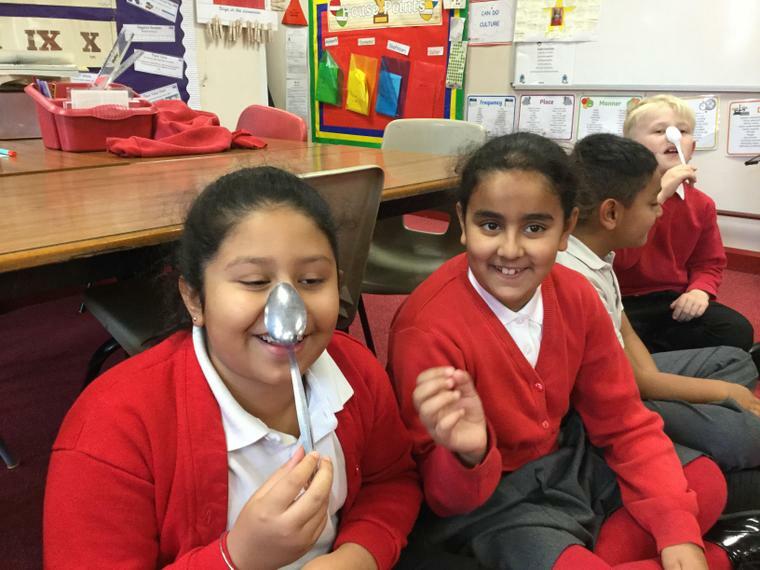 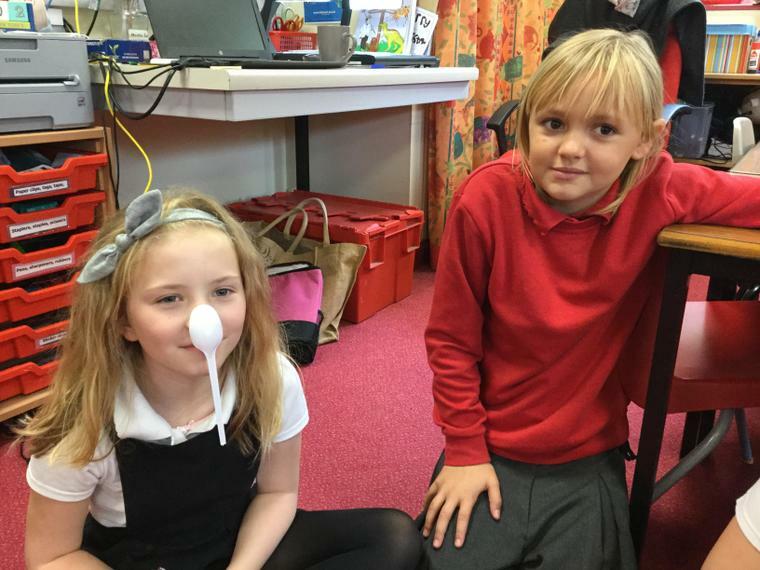 Children tried to balance a spoon on their nose, showing real resilience and perseverance by not giving up! 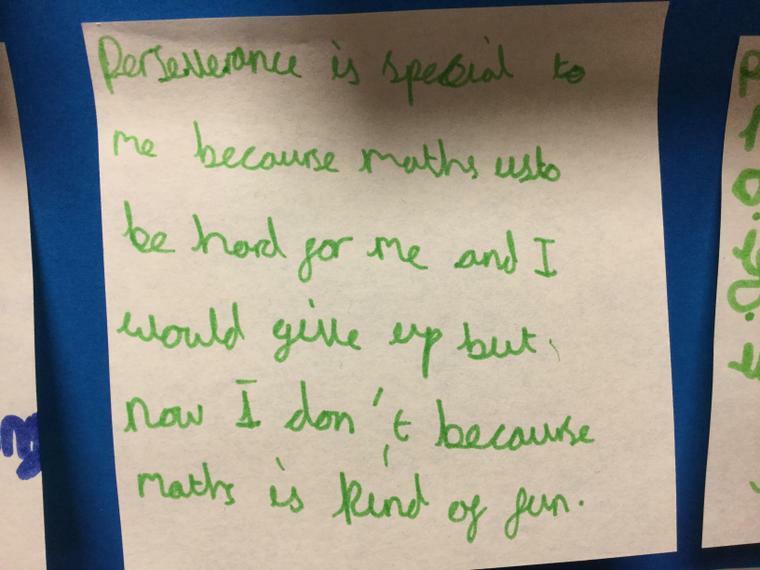 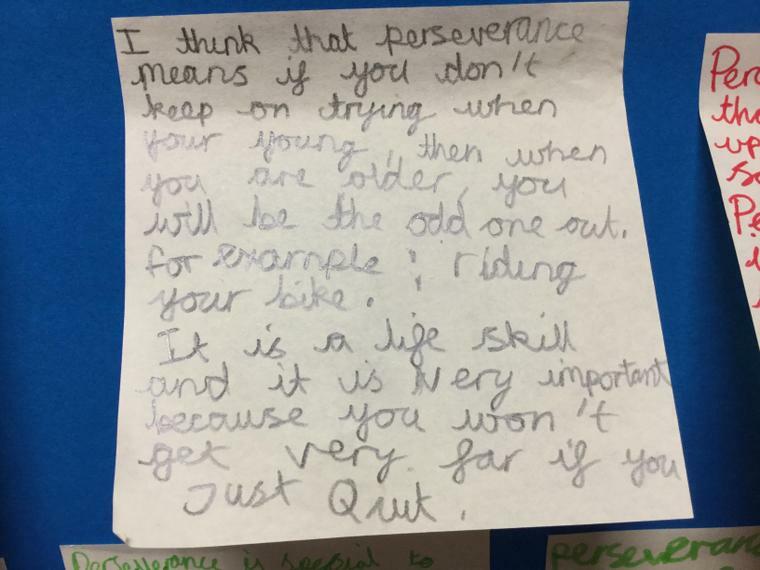 They also wrote some very thoughtful notes on what perseverance mean to them. 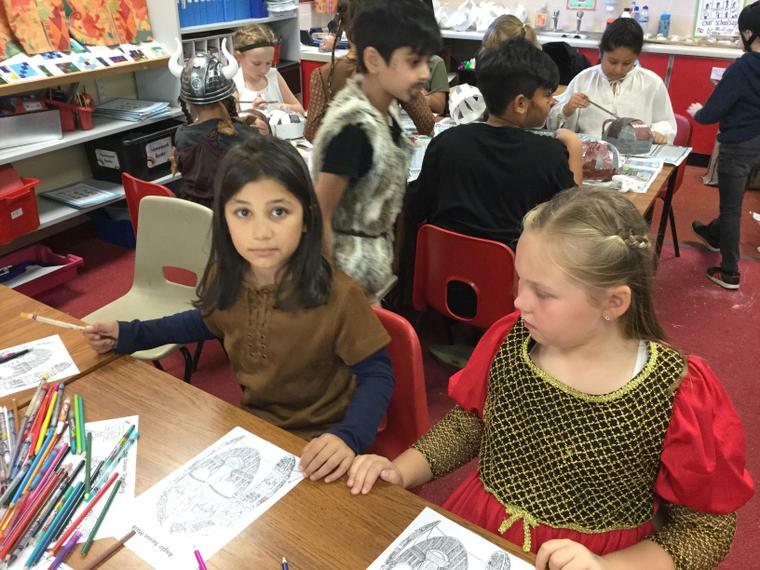 For the past few weeks, children have been learning about invaders and settlers of Britain; hence the Romans and Anglo-Saxons. 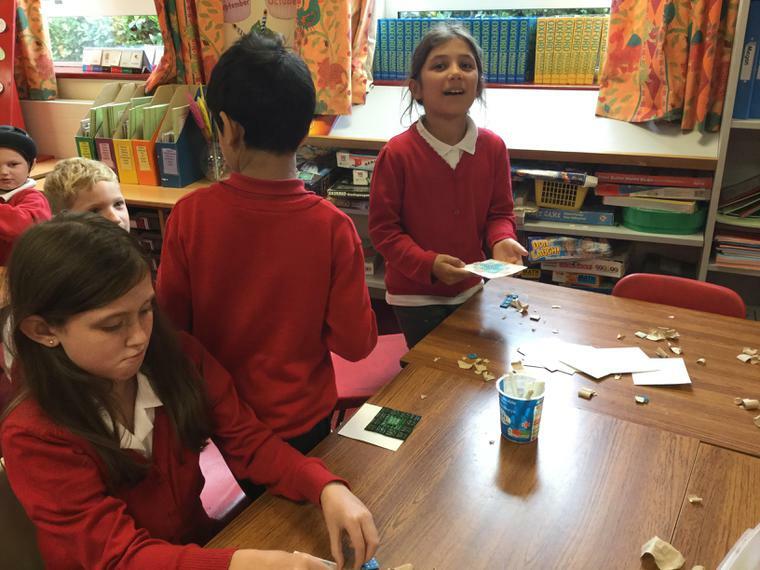 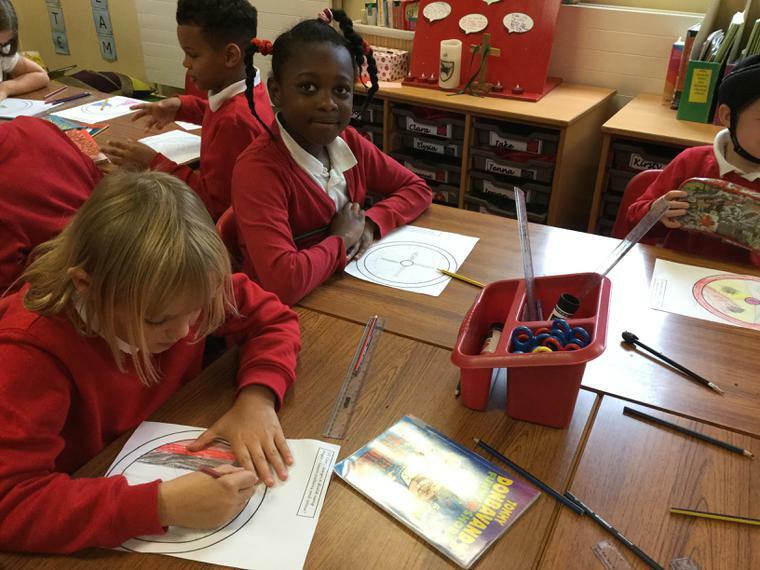 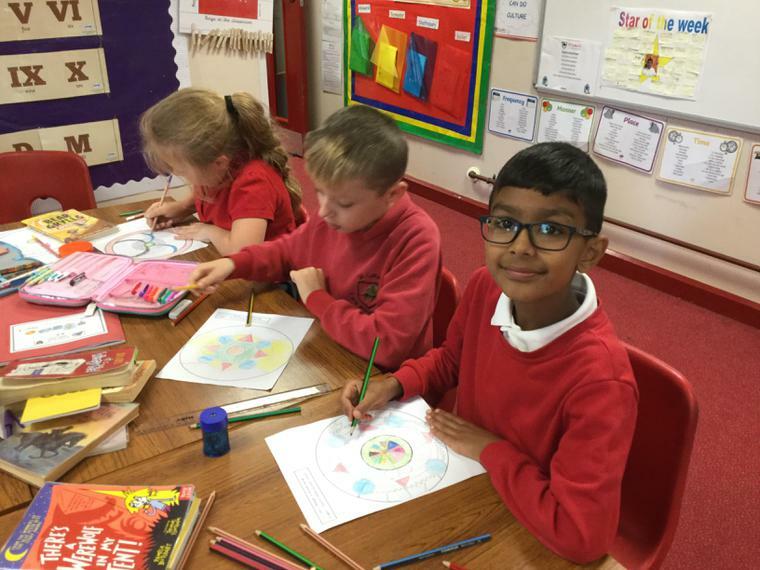 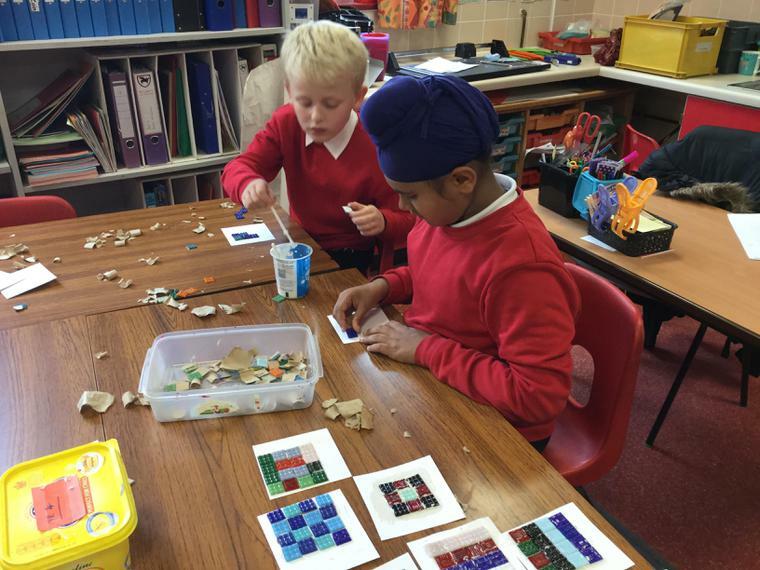 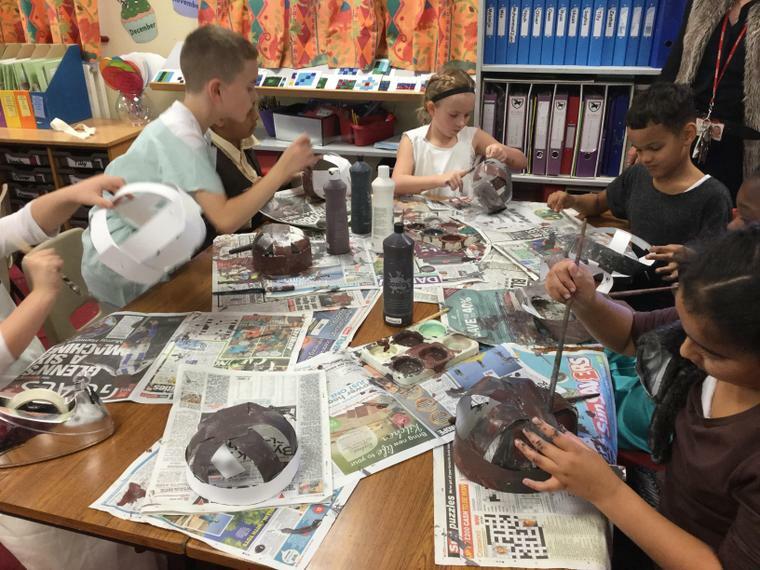 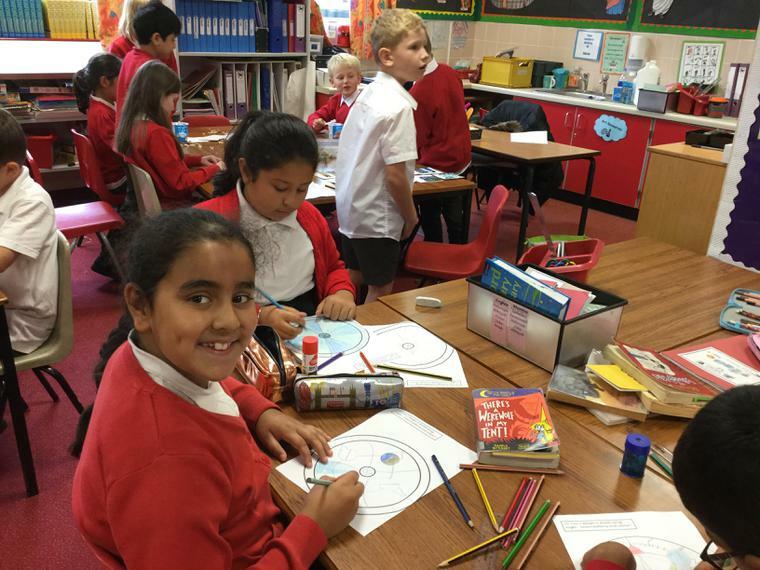 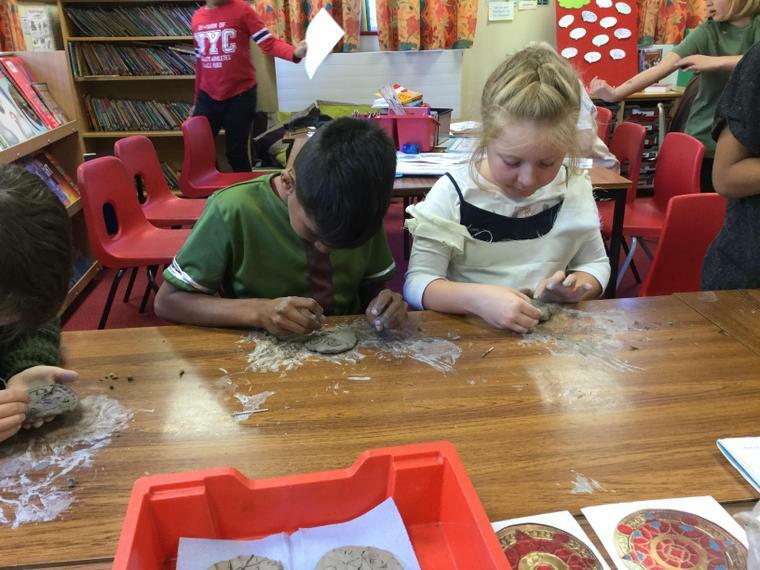 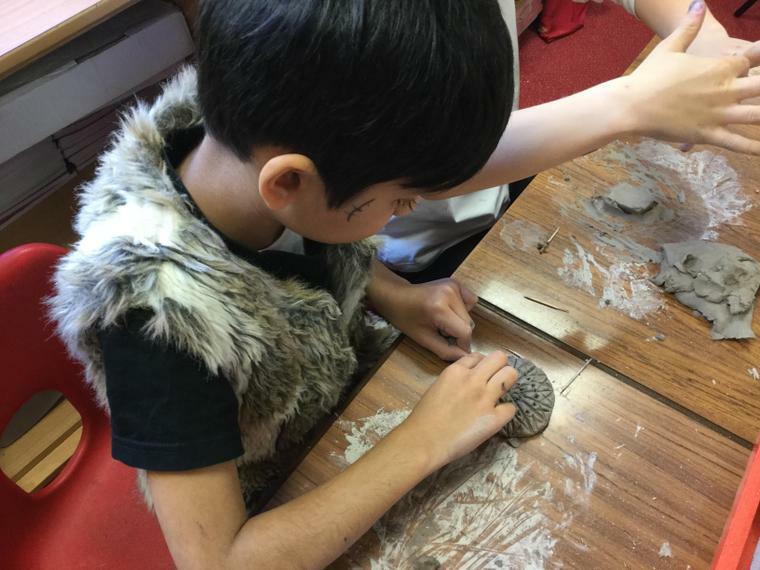 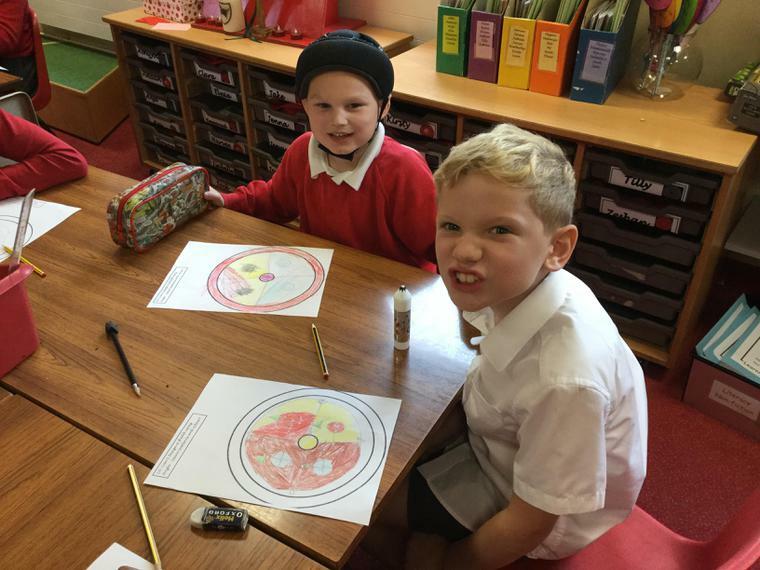 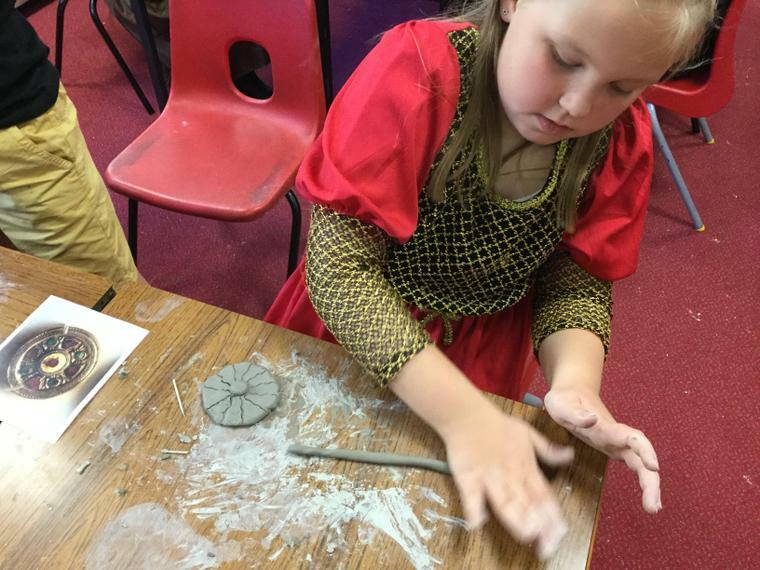 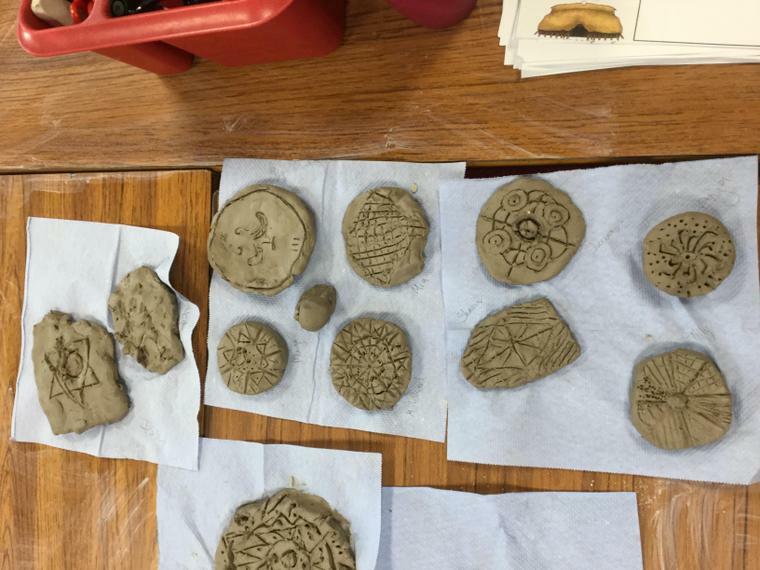 We have started to explore some of their art and culture; making Roman mosaics and designing Anglo-Saxon shields. 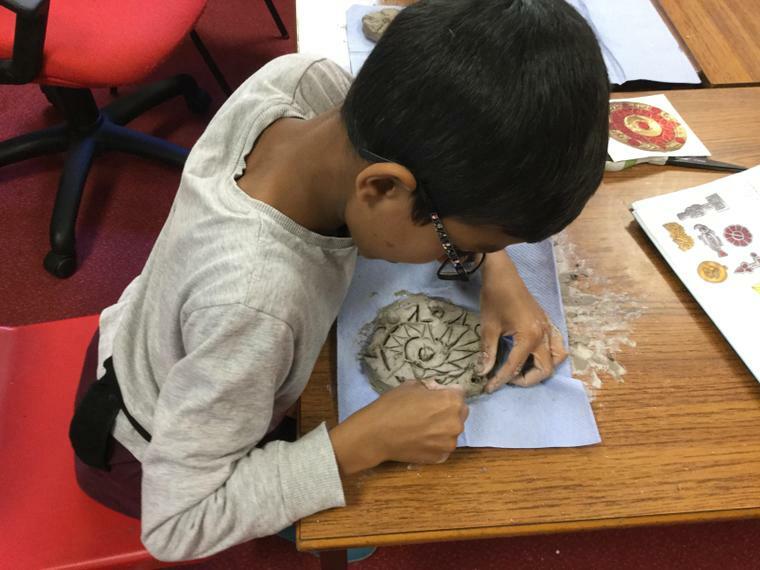 More artwork to come, which will be displayed! 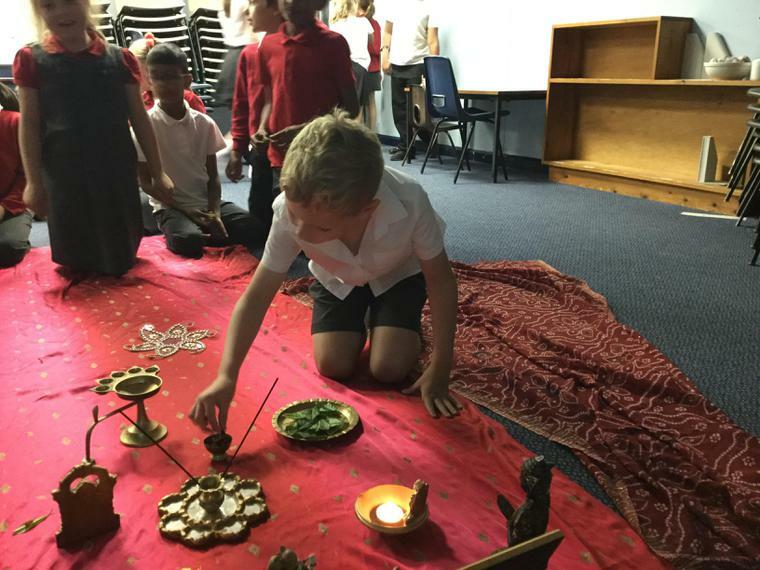 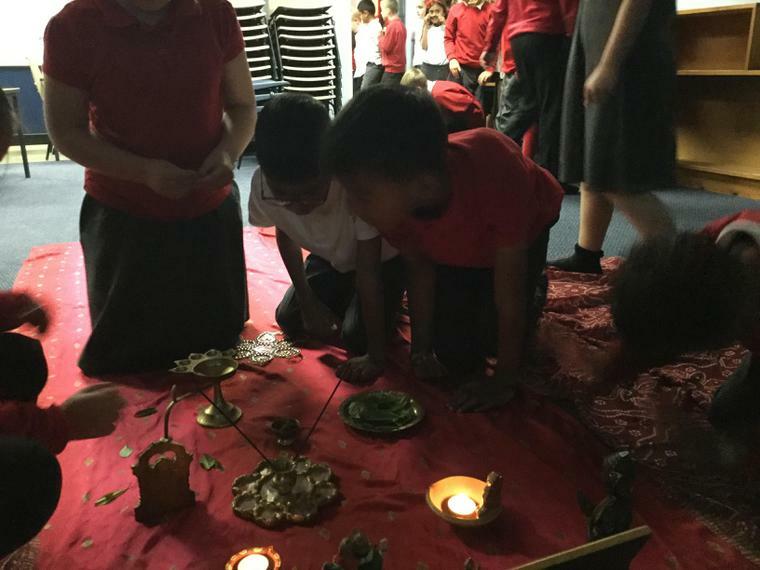 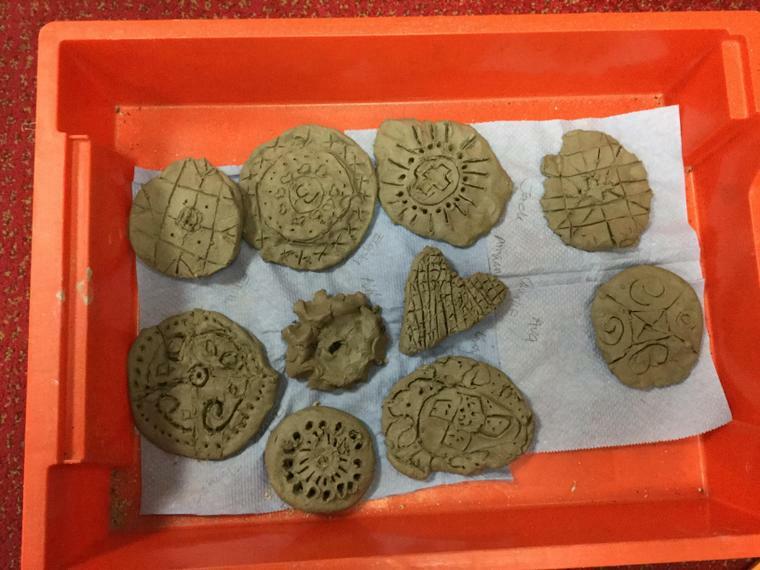 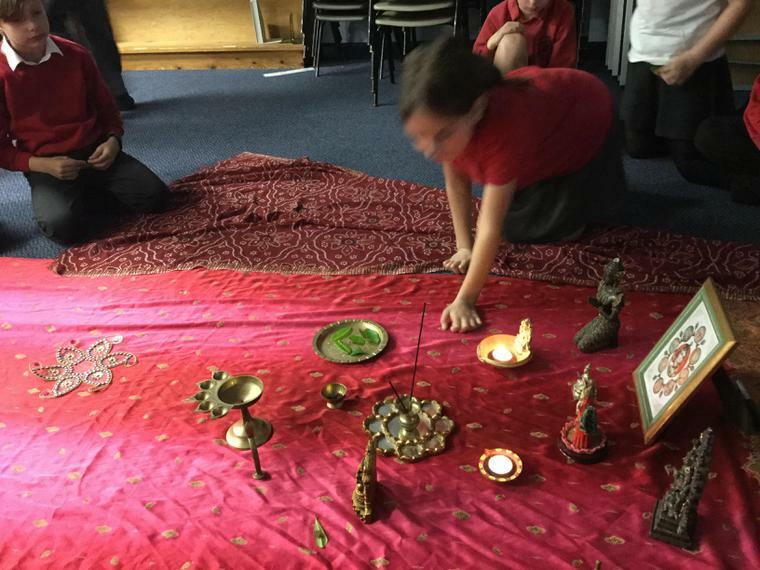 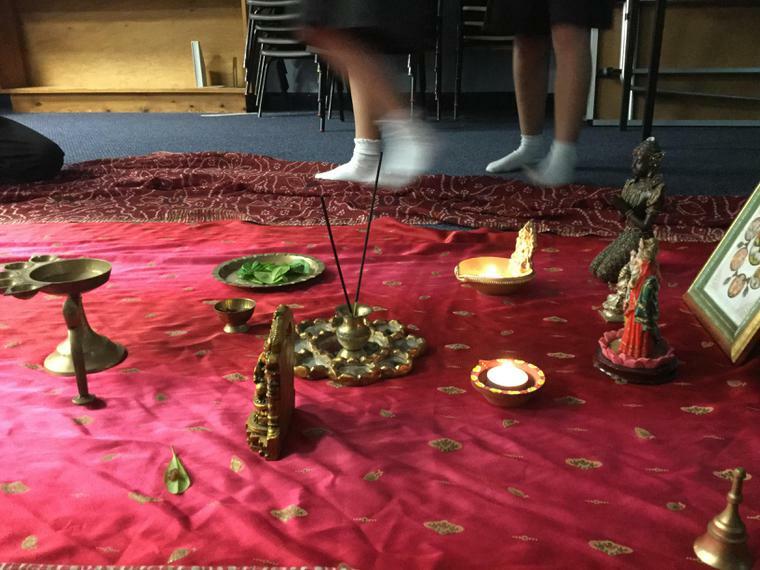 Year 4 have been introduced to the main features of Hindu worship by learning about what happens inside a Mandir (Hindu Temple).